One of my favorite things to do when traveling internationally, is to open the Happy Cow app on my phone and go find an awesome vegan place off the tourist radar. 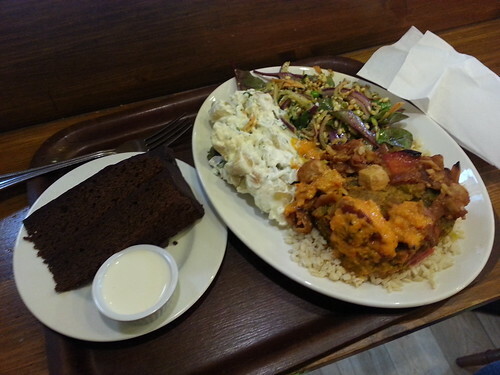 When I first went to Dublin in 2011, I was leery that I would have any luck at all even finding a vegan restaurant, let alone one I would love, and return to again and again. Every day, Cornucopia gets fresh. 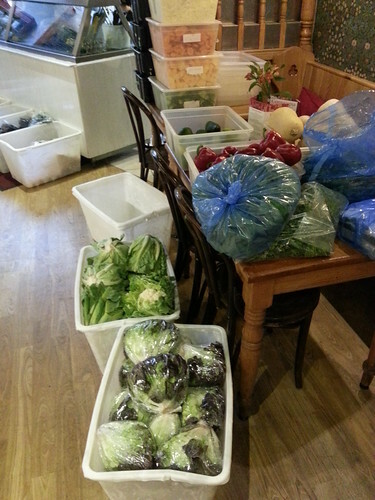 local produce delivered to make the meals for the day. Cornucopia is a local legend, in that it started in the mid 70’s, during a time of political and economic upheaval. 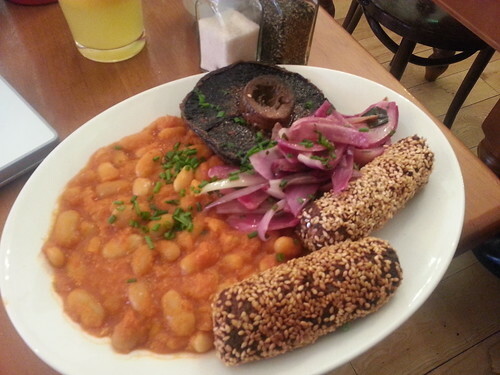 Yet, in the midst of this, two people were able to start and grow a vegetarian/vegan restaurant in the city centre. Every time I return to Dublin, it is a matter of hours before I am again in that long line, squinting at the chalkboard menu, making a very critical decision. Choosing your meal can be a daunting task! Have no fear, I’ll be back again tomorrow. The food here is amazing. The servings are more “American” style than European, but who’s complaining!? 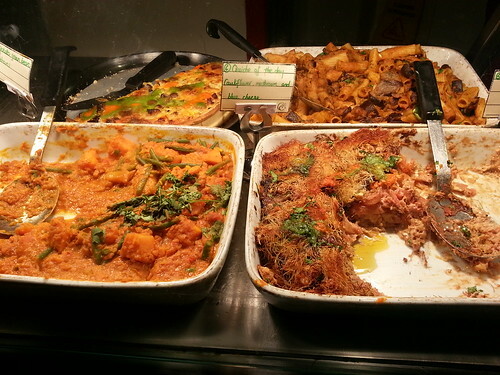 The food is prepared in large batches, kept warm along the bar. Once you choose your main, you can then choose two additional salads. An awesome dessert section is also waiting to lure you from your jet lag delirium. Hello carbs, my old friend. It’s OK, it’s vegan! One of my fav parts of this restaurant is the seating. It is setup in a “home style” with few but large tables set around a very comfortable, homey atmosphere. The old wooden floor creaks, the chairs and tables are worn from the thousands of folks before you. One of the best places to sit, is along the front windows, where you can stuff your face like an autumn squirrel while people watching along Wicklow Street. They also serve vegan breakfast options. One day, before going to work I stopped in and bought out their lot of blueberry muffins for my team. They were very good. The following day, I decided to sit and have a quick bite (it was Saturday) and try their hot breakfast. Vegan housemade sausage, beans, and mushrooms. The sausage was actually pretty good, but it did take some getting used to. The beans were okay, but a weird option for breakfast. And, being the only vegan that HATES mushrooms, well I’ll leave that one alone. Cornucopia is a legendary stop if you are ever in Dublin. 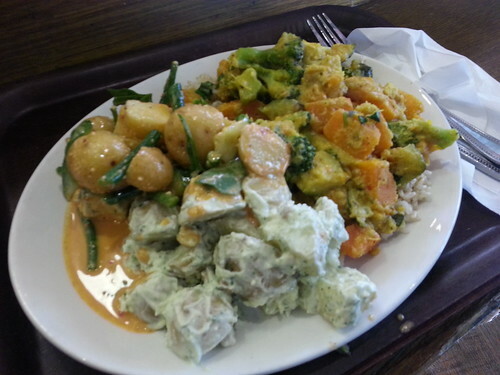 Tip: I found that internationally, vegetarian = vegan. However, Cornucopia does cater to both diets independently. Pay attention to the symbols on the menu when ordering. Edit: BUY their cookbook! My fav potato salad recipe (on this blog) is from it. Its an amazing addition to our kitchen library! Did I mention I am eating for six?